Alex Roytman recently wrote a piece on Building Real-World Cognitive Solutions. Profound Logic and IBM Systems will partner together for a webinar on Adding Professional Services for Sure-Fire Project Success on March 25th, 2019. Register today! Profound UI's Grid Widget Set shows you how to display your subfiles in your Rich Display Applications. Learn how Using GIT with Profound.js Makes IBM i Development Easier. This Profound Pro Tip shows you how to create Custom Context Menus. Profound UI Version 6 has a new Fix Pack 2.6 that is available now! Every application at one time or another has to go through the assessment of whether it is still viable and useful. Does the application continue to meet the evolving needs of the business or should a new and improved application be brought in to handle the companies needs? When it comes to software on the IBM i, these types of questions are especially tough. Aging IT systems can give companies pause and lead them to want a more "agile" or "flexible" system. Some call this digital transformation, some call it application modernization. Whatever you call it the goals are always similar: Simplify the underlying code base, improve code maintainability, and make it easier to implement new functions or integrate with outside systems. In Alex's latest piece he dives deep into assessing IBM i's role in this new digital transformation age. The rise of Artificial Intelligence (AI) has brought so many amazing and unbelievable advances to our world. Things we never thought would be possible. With this rise of "unbelievable" advances came an almost mystical atmosphere around AI. This magical technology was doing things with such little effort that used to take years, if not decades to do. This view of AI also brought the thought that only specifically trained experts who had mastered this new technology could implement the future. The truth of the matter is that there is no magic to AI. Artificial Intelligence was first introduced in the late 1950s and has continued to progress ever since. As it has progressed it has become more and more accessible which mass experimentation breeding breakthroughs that help everyone. AI is altering the way business is conducted and is enabling prediction with supreme accuracy to help with business decision-making. To breakdown the "mystery" surrounding AI you need to consider two elements: the componentry and the process. Identify what is behind it and how it can be adopted. Many companies are worried about the perception that their system is "outdated" with a green screen interface. Profound Logic is the leader in application modernization efforts, giving our customers one of the easiest and cost-effective ways to give their system the "upgrade" it needs! 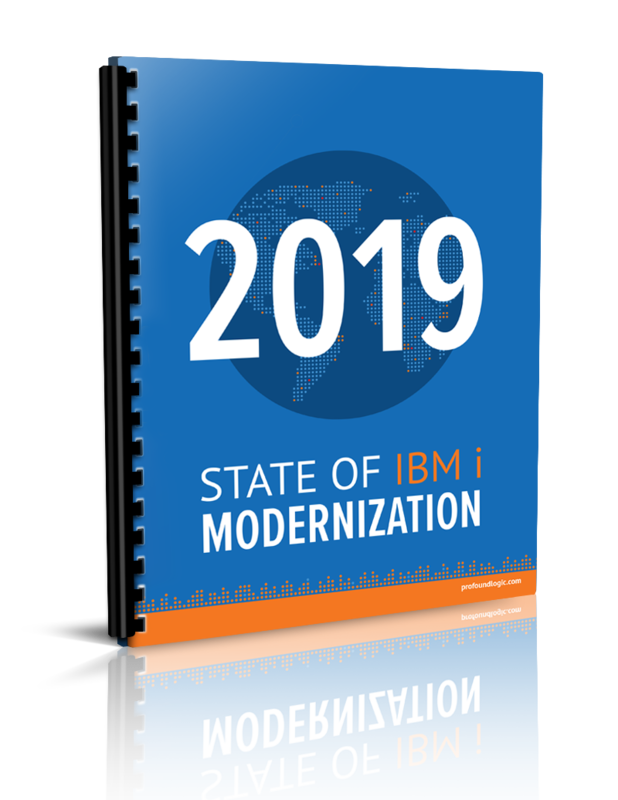 ....and get The 2019 State of IBM i Modernization White Paper FREE!